China wants to invest in a fourth set of locks on the Panama Canal, in addition to its proposal for a new canal in Nicaragua. Panama Canal Administrator Jorge L. Quijano recently met with a Chinese delegation, headed by China Harbor Engineering Company (CHEC) Chairman Mo Wenhe and Chinese-Panamanian Office of Business Development representative Wei Hua Wang. 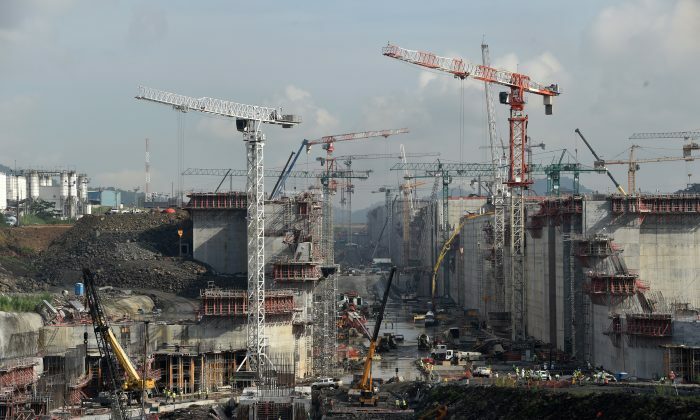 “We are exploring our participation in all Canal projects, especially in the design, construction and financing of a Fourth Set of Locks,” Mo said, in a press release. CHEC is one of China’s largest state-owned enterprises with foreign operations, according to business research company Hoovers. It’s a division of China Communications Construction Company that specializes in channel dredging and harbor construction. CHEC is moving its regional headquarters to Panama. The Panama Canal is really two canals, currently, each with a set of locks. That’s about to change, however. Construction on a third canal began in 2007, and is one of the largest construction projects taking place in the world right now. There is also a project to expand the current Panama Canal. The third set of locks will allow larger ships to pass through the canal. Yet, before the third canal finishes in December 2015, China is already negotiating with authorities in Panama to build a fourth. Panama Canal administrator Quijano told JOC in June that a fourth set of locks is not currently financially feasible.